Have you ever wondered why the Bible is shown as a sword? It’s been a journey (a writing journey that is) to find out, and I’m really excited to share it with you. A verse that had always baffled me was Matthew 10:34, which says, Do not think that I have come to bring peace to the earth. I have not come to bring peace, but a sword. Why would Jesus be talking about division? In the writing of my novel, (and the reading of another novel, which I will not name to save spoilers) the Lord has revealed to me that it is not those who follow Him that yield the sword, rather those who follow the world. If Jesus was love, why would He come to not send peace? It’s simple. Just look at the world we live in. We live in a fallen society that relies on self fulfillment and human lust. It’s the very reason we’re here, some might say: to gain all we can. Or as I like to say: to feed the virus. Jesus knew our world revolved around sinful desire. He knew we focused on our own lusts, and we still do to this day. Yet He sent His son to die in our place. So now we see, the sword isn’t us separating ourselves and dividing ourselves from the world, it’s the world dividing themselves from us. Christ’s followers. We don’t yield the sword, the world does, because the sword can only kill. Yet the love of Jesus threaten’s those who yield the sword. In the unnamed novel I mentioned above, in the end the main character realizes who holds the sword and she gives up her fight and turns the other cheek. In doing so the enemy believes she is possessed and actually hides, because her actions were so different it threatened them who saw her. So the love of Jesus really is strong enough to divide. The Gospel really is like a sword. A sword that kills all selfish motives with sacrifice and love. And why wouldn’t we love like this? In the end, aren’t we all brothers and sisters standing under the cross? 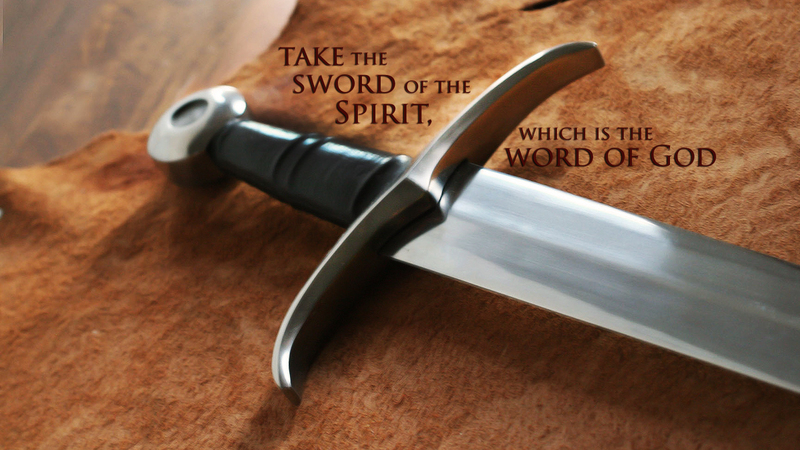 So will you take up the Sword of the Spirit with me?